Eyeshadow is my favourite thing to do when it comes to makeup. I love all of the different looks you can do and also exploring new palettes. 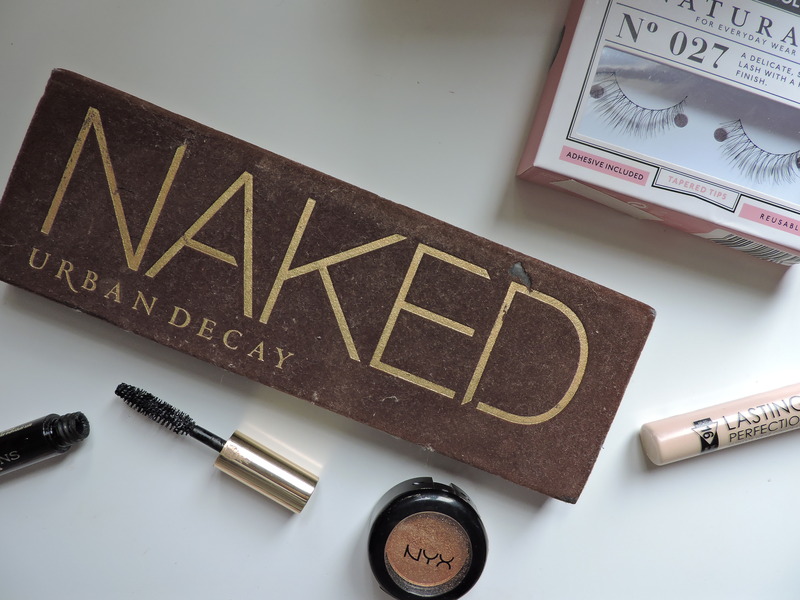 I ABSOLUTELY love The Urban Decay Naked eyeshadow palette. It is probably one of the most popular palettes out there and it has been out for a while. This palette is like holy grail and so I decided to do a blog post on it. 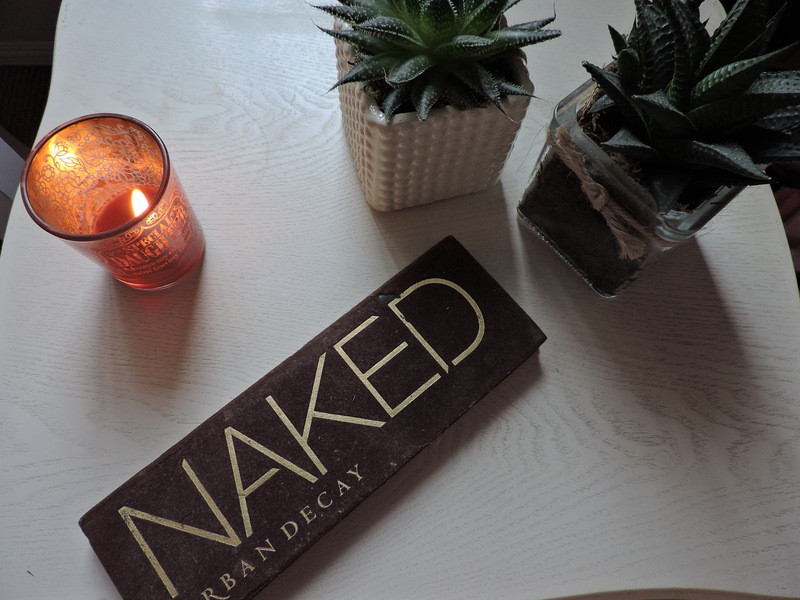 This palette was the first of many items that I brought from Urban Decay which was a while ago and I still absolutely love it. I tend to reach for this palette a lot as I really like using brown eyeshadow because the orangey tones bring out the blue in my eyes. 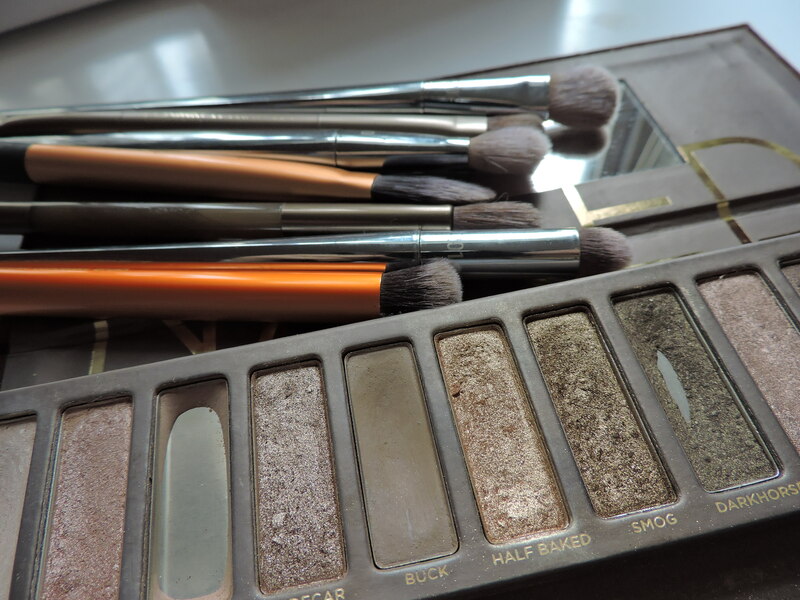 In this palette there are a lot of neutral beige colours which are my fave colours to use. Also because this palette never fails me! 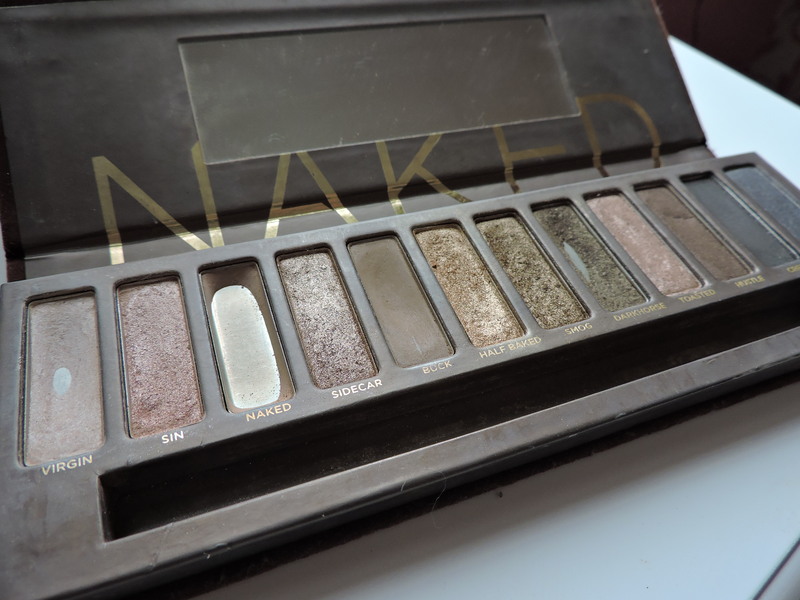 The palette was £39.50, which could be considered pricey, however, for Urban Decay it is pretty standard. The price is extremely good for a 12 coloured shadow and especially because it is very durable. Even though my palette has had a couple of knocks it is still in good condition. In a way I much prefer this packaging to the Naked 2 and 3 because it is not as bulky as the other two, but on the otherhand, I think the other two palettes are more compact and obviously the packaging doesn’t allow any knocks or scratches. The colours in the palette are stunning, you have a mixture of shimmer shades, glitter shades and matte colours. One of the colours in my palette has nearly gone, THIS MAKES ME SAD! The colours in the palette are extremely pigmented! 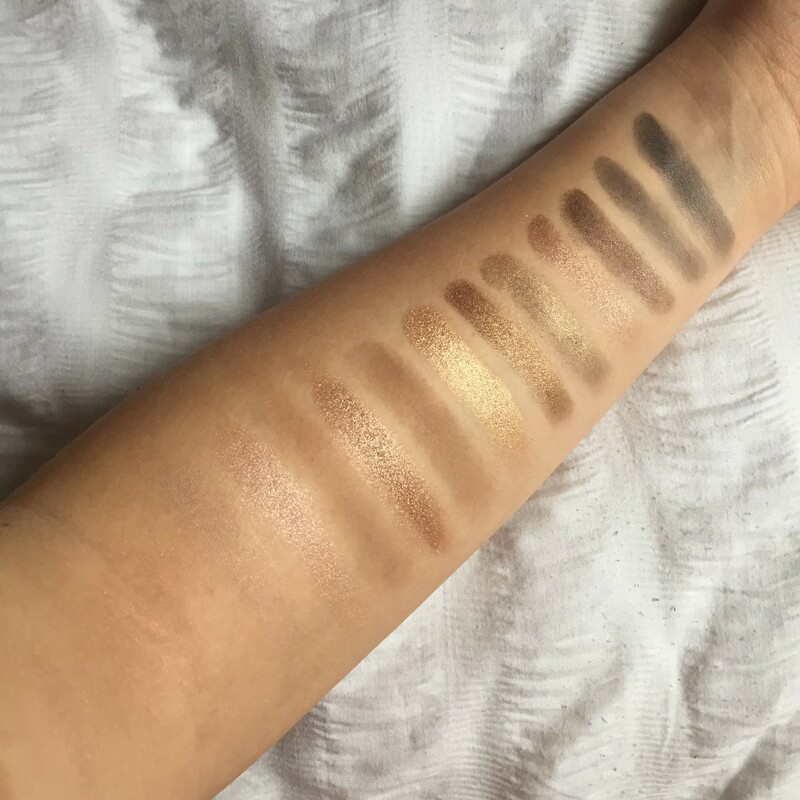 Some of the more glittery colours such as Sin, Sidecar, Half Baked, Smog, Darkhorse, Toasted, Hustle are so pigmented that they actually look like creme shadows. The other matte colours are still very pigmented, and they aren’t chalky which is really nice and at times helpful. There is a big varity of colours in this palette, all very neutral but stunning. The colours I don’t really use are the last three- Hustle, Creep and Gunmetal, but I find that with every palette you buy, there are always going to be colours that you will never use. Am I right??? Naked as a base colour, I use this all over the lid. Buck from the middle of the lid, blended out to the outer corner of the eye. Darkhorse used in the crease of the eye and blended. Half Baked will be applied over Buck and Smog will also be applied in the crease. Half Baked will also be used on the brow bone and blended. Darkhorse will be used under my bottom lash line in the outer corner, followed by Buck in the middle and Naked in the inner corner. This is basically just going to mirror what is on top of my eye lid but underneath. Lastly, I will add Virgin to the inner corner of my eye. This eye look is a brown smokey eye look, that I sometimes use for my everyday eye look all year round. Virgin will be applied all over the eyelid as a base colour. I will then apply Sin on top of this and then add Sidecar to the outer corner of my eye. I will also add a tiny bit of Buck, to the crease just to make the eyeshadow a bit darker. Then using Toasted I will apply this to the outer corner of the eye, going over Buck to tone down the browny shade. I will apply Toasted on my bottom lash line. Virgin will be applied on my brow bone. This eye look is a pink glittery one, mostly used in summer and spring. Buck is my base colour for this look, and I will apply it over the lid. I will then apply Half Baked all over the lid and make sure it is blended well. Using Smog I will apply this to the outer corner of my eye and inside the crease. I will then also take Smog and apply it under my lash line and blend it, more so in the inner corner then the outer corner. This eye look is a brown glittery one, mostly used in summer. I LOVE REAL TECHNIQUES BRUSHES AND IM PRETTY SURE THAT I AM NOT THE ONLY ONE. Their brushes are amazing! I’m sure everyone owns at least one Real Techniques brush, and if you don’t then you are missing out. Most of the eye brushes that I use are either Urban Decay or Real Techniques. Real Techniques brushes are very good quality, you basically get what you pay for and it really comes across when you use them for your eyeshadow. The original packaging with the coloured handle and the black end makes these brushes very popular for being the Real Techniques brand. The good thing about these brushes is that you can buy multiple brushes in a pack, or buy them seperately which is useful. 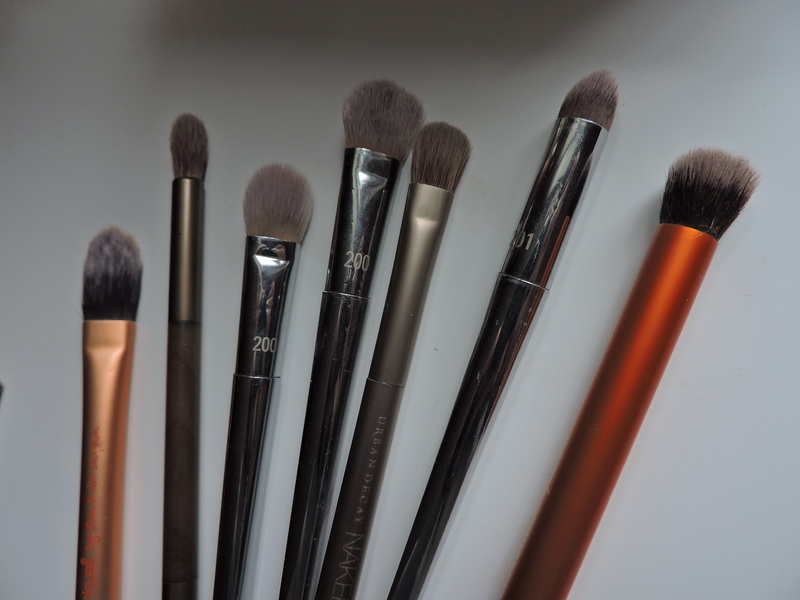 Their Bold Metallics range of brushes are stunning, the packaging is beautiful, and it’s quite annoying just how beautiful they are, because you end up wanting every single brush. Real Techniques Pointed Concealer brush- I use this to do my concealer under my eyes. I use the Collection Lasting Perfection concealor as it is INCREDIBLE for under the eyes. I use the lightest shade in the shade Fair. Urban Decay Smokey Eye Palette brush (this brush actually came with the Urban Decay Smokey palette, and if you have this palette you will know that the brush that comes with it is fricking brilliant! It is a dual ended brush so on one end it has a smallish/just right sized brush which is good for doing the outer corner of your eyes. Then on the other end it has a very small circular brush which is really good for getting right into the crease. Real Techniques Bold Metallic brush 200, for some reason there are two brushes with the same number and I’m not sure why. The brushes are different the one of the left side, is thinner then the one on the right side. I use these to apply the shadows more so on the outer corners, also to blend and add glitter if I need to. The one on the right side is good for applying glitter as it applies the glitter more evenly. These brushes are good for applying a lot of eyeshadow on at a time. Urban Naked Palette brush- I find this brush really useful to use for glitter. I tend to dab glitter onto my eyes rather than like blending it in. After I blow of the excess glitter, I find that dabbing it on doesn’t make the glitter flake off and it looks more evenly applied. Real Techniques Bold Metallic 201 brush- this brush is good again for using in the crease, but also the brush itself is actually quite small so its good to use on the eyelid if you don’t want to use a big brush. It is also good for blending the eyeshadow under the lash line. Real Techniques Deluxe Concealer brush- this brush is probably one of my favourite eye shadow brushes. I use this brush to blend. So every new colour I apply to my eye, I will blend with this brush. After doing all of my eyeshadow I will then blend the whole thing together with this brush. Also good for putting highlighter under the brows!! Truly a lifesaver! What’s your favourite thing to do when you do your makeup?? ALSO, would you recommend any eyeshadow palettes?